As a “worship leader” (being one who takes a lead role in facilitating the people’s worship), one of our key tasks is choosing the set of songs for a service. What’s the best way to choose which songs we do? Do we just choose the most popular songs at the time? How should we approach our song choices? There are numerous aspects to take into consideration, and I won’t address all of them here, but I want to explore one aspect of choosing, and indeed writing songs, that often gets overlooked. The diagram above illustrates 4 quadrants, or categories, that most ‘worship songs’ fit in to (there is actually a 5th as well, but I’ll get to that later!). I’m referring here to the theme and focus of the lyrics of the song – to whom the song is being sung, and whom the song is about. Songs often fit into a couple of categories as often the focus changes within a song – sometimes even within a verse or a chorus! To us, about us: like “I am a friend of God” and “It is well with my soul”. These songs often make declarations about who we are as followers of Christ and remind us of what God’s word says about us, or to us. To us, about God: use phrases such as “How Great is Our God”, and our God is “Mighty to Save”. 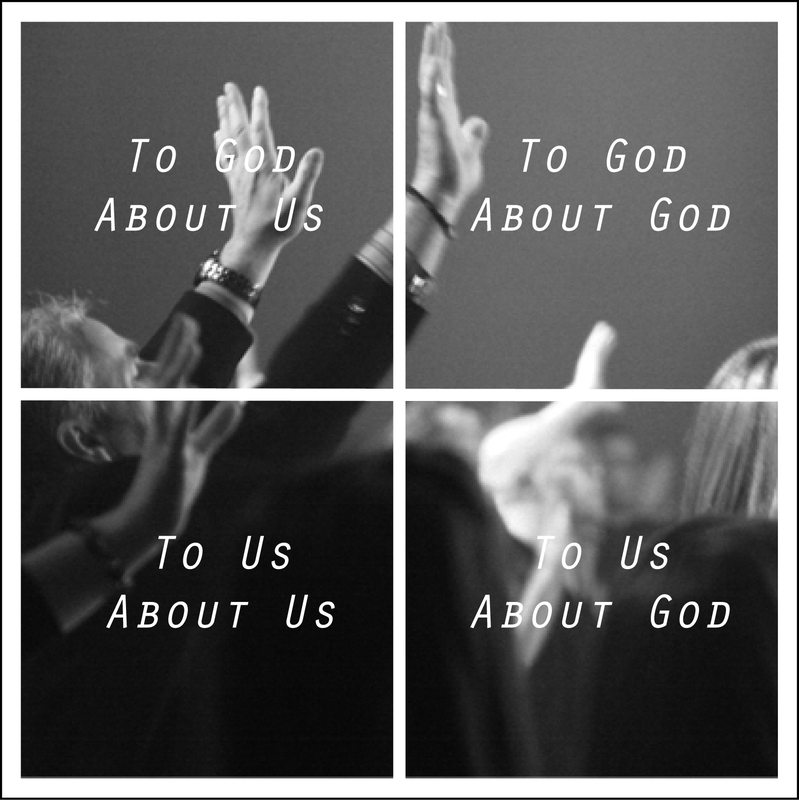 They are proclamations about who God is, His qualities and character, and what He means to us. The lyrics are stated in the 3rd person, about God. Many of the Psalms are written in this mode, and therefore it’s natural that our modern songs echo those thoughts. To God, about us: such as “Here I am to Worship”, use phrases such as “I am devoted to you”, or “I surrender to You”. They are songs of devotion, contrition, surrender or even lament that speak to God (in the 1st person) about our circumstances or situations. To God, about God: like “Indescribable”, “You are Good” and “How Great Thou Art”. They are sung directly to God, in the 1st person, and tell of His qualities and character, such as “you are majestic, holy, worthy of honour, glory and praise”. They are songs that allow us to say what God is worth – literally His “worth-ship”. This is the ‘worship quadrant’! They are songs that give expression to the deepest cry of our heart to say how incredible God is (Psalm 42:7). PS. for those who were paying attention, I did mention a 5th category of song that doesn’t fit into the quadrants! It is songs that are written from the perspective of God speaking directly to us – that is, written in the 1st person to us, from God! They might say things like “You are my child, I love you”, “you are my beloved”. These songs are fantastic too – they are kind of like the “about God, to us” and “about us, to us” songs combined.